Herbert Stanley Seaman served with the U. S. Army from April 20, 1941 until March 7, 1945. He was assigned to Battery C, 63rd Field Artillery Battalion and was originally serving on Hawaii. He was there during the infamous attack by the Japanese on December 7, 1941. His job originally was a jeep driver assigned to bring pilots to their planes. On the morning of December 7th, he did not make it to the planes. He was wounded when a bomb exploded nearby during the attack and spent six months recouperating from his wounds. After recovering from his wounds, Herbert served in the following campaigns: New Guinea, the Southern Philippines and Luzon. Of the attack on Pearl Harbor and the surrounding military installations, Mr. Seaman told his son, Keith, "He told me he could see the Japanese pilots in the windows of the planes they were flying so low." Herbert Stanley Seaman was 80 years old when he passed away about a year and a half ago. The above information was passed on to us by Mr. Seaman's son, Keith. Mr. Seaman also left this war souvineer along with a few other momentoes of the war years to Keith. Keith has been gracious enough to allow us at World War II Stories -- In Their Own Words to share in these very personal memories. 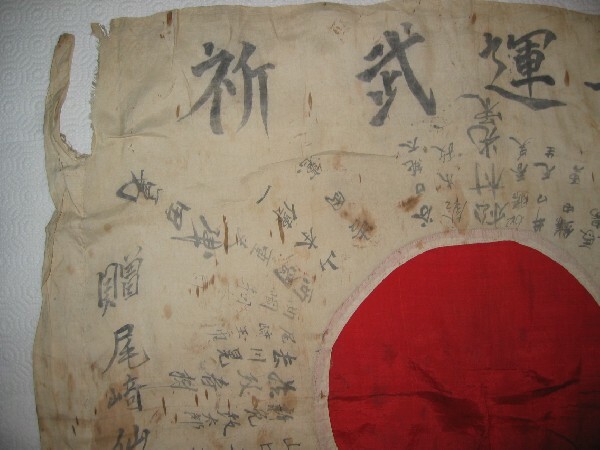 The flag below was presented to a young man who went off to war. A total of some 50 friends, relatives and neighbors, signed the flag. The names below are the given names -- the surnames are the same with minor variations. Some of the names were specificially identified and are numbered accordingly. Some of the others are named, but not specifically identified. "Prayer Good Fortune for Warrier Long Live!" 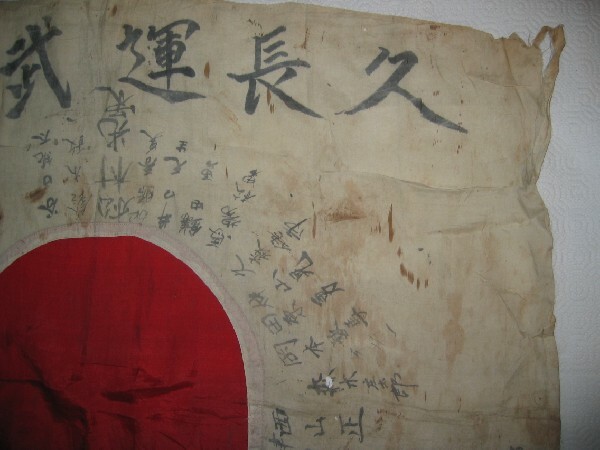 Full view of the captured Japanese flag. Top Left Corner of the flag -- enlarged for detail. Taniguchi, Suzuki, Matsumura, Iguchi, Kamada, Yashioka and others. Lower Left Corner of the flag -- enlarged for detail. (1)Yamaguchi, (2)Hayashi, (3)Umemoto, (4)Shimomura, (5)Yoshioka, (6)Nakanishi, (7)Okada, and (not numbered) Ishikawa, Matsui and others. Top Right Corner of the flag -- enlarged for detail. Mishiyama, Okamoto, Kamata, Taniguchi, Tabara and others. Lower Right Corner of the flag -- enlarged for detail. (1)Nishiyama, (2)Tsuda, Ozaki, (3)Okada, (4)Yamamoto and others. Photographs were generously provided to World War II Stories -- In Their Own Words by Keith -------- whose Dad served in the U.S. Army during the war. He was at Pearl Harbor and then in the Phillipines. He obtained this flag while there. Our sincerest THANKS for allowing us to share this stories! Original Images submitted on 8 October 2004. Story added to website on 1 November 2004.